In even the most cordial of divorces, a dispute over property can lead to a serious conflict. A property disagreement over money or assets that a couple has earned during the course of their marriage is one thing, while disputes regarding sentimental possessions, particularly inherited assets is another matter entirely. Indeed, disputes over inherited assets can turn especially emotional. Under Florida law, your spouse may be entitled to a portion of your inherited assets. That being said, there are things that you can do to protect these assets. Here, our experienced Orlando property distribution attorney explains everything you need to know about inherited assets and Florida divorce. Florida divides property under the state’s equitable distribution legal standard. Essentially, this means that all marital property is divided in a fair manner. In other words, if your inherited assets qualify as marital property, your spouse has a legal claim to a portion of the value of that property. How do you determine what qualifies as marital property? 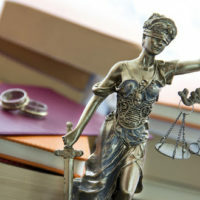 Generally, assets obtained prior to a marriage are separate property; whereas property obtained after the beginning of the marriage is marital property. Though, there are many exceptions to this rule. As such, an experienced attorney should always review the individual circumstances of your case to determine if your inherited assets are subject to equitable distribution. If you have inherited assets, whether it is an interest in the family business, an heirloom, a portion of your family’s real estate, or any other important property, you need to take action to protect those assets. The single best thing that you can do is to craft a legally enforceable prenuptial agreement or postnuptial agreement. Your marital agreement should clearly delineate that your inherited assets are separate property and that you will retain full possession of in the case of a divorce. If you have specific inherited assets that you wish to maintain possession of, but the assets are marital property and you have no prenuptial agreement in place, you are in a more difficult position. Still, you are certainly not without legal options. At this point, you need to work with a skilled Orlando divorce lawyer who has considerable experience negotiating divorce settlements. You have a lot of flexibility when it comes to making a divorce settlement for your specific case. Your attorney can assess your circumstances and determine what specific issues are important to you so that you can negotiate favorable terms. At the Law Offices of Steve W. Marsee, P.A., we have extensive experience handling complex Florida divorce cases. If you are getting divorced and you have any concerns about keeping your inherited assets, please call us today at 407-521-7171 to set up your fully private initial consultation. From our office in Orlando, we represent clients throughout Central Florida, including in Kissimmee and Sanford.